How do I take full advantage of infinite display on my Galaxy Note8? Take your mobile gameplay to new heights. With the AMOLED QHD Infinity display on your Note8, you're now ready for the next level visual experience you've been waiting for! Note: When you want to see every detail in that new action movie, change your screen resolution by using the slider. Just follow the steps below. 5. To change the screen resolution, drag the slider to the desired resolution and then touch APPLY. Note: Higher resolutions make the display more vivid, however they will consume more battery power. 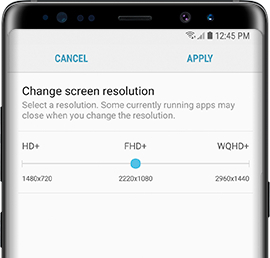 Important: All active apps will be closed when you change the resolution. Note: Having a hard time reading in the dark? You can adjust the brightness and clarity of the images shown on your phone by using Screen Mode settings. Follow these instructions to give your eyes a rest.